RECENT PRICE DECLINE! Newly remodeled in 2019, this beautiful modern estate home offers stunning lake views & fifth hole golf course frontage in 24-hour guard-gated Keene's Pointe. This is a stunning & contemporary one-of-a-kind estate home! 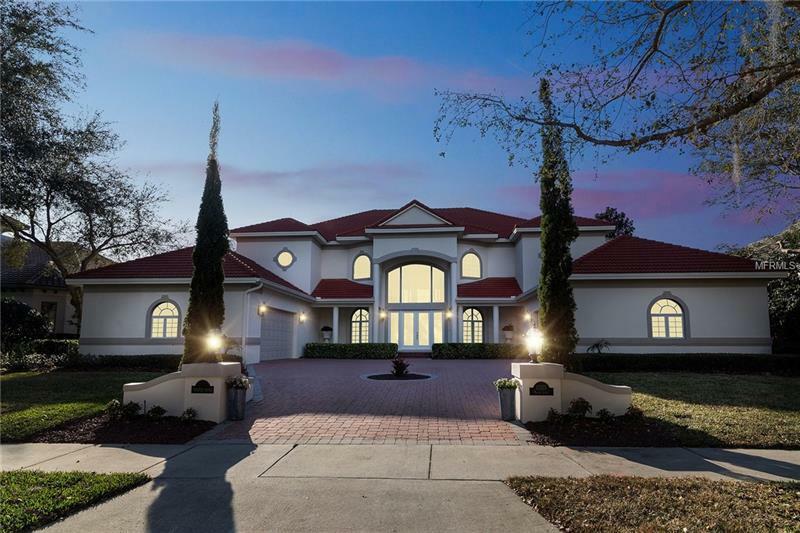 Built by custom home builder, WJ Saurwine, specifically to take in the amazing sunsets, Disney fireworks & views of Lake Burden. Enjoy breathtaking views when you enter your stained-glass front door of the pool and lake. Grand staircase with amazing motorized & retractable chandelier welcomes you upstairs. New ground floor dining & gourmet kitchen are one grand space with room to entertain in this open floor plan! All new Viking appliances & optional elevator & second laundry upstairs. Wine bar built in & other unique features plus a 4 car garage. Master Suite is upstairs off of living areas with bay window for a great elevated view of the golf course and Lake Burden. New Master Bath has all upgrades, new large walk-in closets and large open shower and garden tub. You will find four suites plus baby nursery that's great for in-laws or live-in staff. Relax & enjoy billiards and movies in your new game room. There is office space plus bonus room for exercise or nursery. French doors lead you onto the bricked paver, covered patio with retractable screens, summer kitchen & heated pool. The electronic screens can be raised & lowered for privacy and entertaining. Common dock and boat slip are close by. Home is on a cul-de-sac street, so very private! Amenities Additional Fees: Certain Community features will require membership within the Golden Bear Club in Keene's Pointe.